Laurie K. Mischley, ND, is a Seattle-based naturopathic doctor. She is one of several professionals who make up Seattle Integrative Medicine on Roosevelt Avenue in the University District. She also has an appointment at Bastyr University and conducts research at the University of Washington, where she recently earned her M.P.H. and Ph.D. For fifteen years she has been treating patients with Parkinson’s disease for fifteen years. Because of her experience with patients and her increasing involvement in research, she is convinced that people with Parkinson’s can be helped by both traditional and nontraditional therapies. Conventional therapies, she says, are good at “defense.” They treat the disease once it manifests itself through its most common symptoms: tremor, slowness, gait, and balance. Conventional therapies ease the symptoms by using pharmaceuticals to reduce the symptoms once they show up — which is typically a decade after the brain begins to loose the ability to create dopamine. Naturopathic therapies, on the other hand, she says, are good at “offense.” Their role is preventing the symptoms from showing up in the first place and then, if they do show up, working to stop, slow, or reverse the progression of the disease. Dr.
Mischley insists that to succeed, a patient needs to have both an aggressive offense and a strong defense. How, in practical terms, can the offense go into action to head off the arrival of the symptoms? Her answer is that there are some early warning signals. For example, if you have a close relative who had Parkinson’s, your chance of getting the disease are much higher. If you were in Vietnam when we were using Agent Orange as a defoliant, or if you grew up drinking well water or spring water in a rural community where farmers used pesticides and herbicides, then you might want to heed the advice that Dr. Mischley gives in her book. What is that advice? Well, some of it is pretty technical. 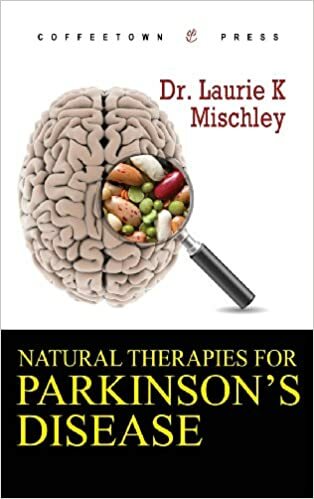 Dr. Mischley says in her introduction that her book can be used by “patients, physicians, caregivers, and relatives of those with Parkinson’s.” (1). When She talks about Lewy bodies she apparently has in mind an audience of physicians: “Lewy bodies are composed of ∝-synuclein and ubiquitin, two proteins associated with disease progression in PD. . . . They are found floating in the cytoplasm of neurons” (11). Yeah, right. Few patients will know what in the world she is saying. In a sense, however, it does not matter whether lay people can understand technical sentences like that, but it is comforting to us to know that she does. She needs to understand why she gives the advice she gives; we need to understand only what the advice is. What are free radicals? I don’t know. I gather from reading her book that all human brains produce bad guys called free radicals, which tend to destroy brain tissue. In healthy brains these free radicals are offset by good guys called antioxidants. In the brains of people with Parkinson’s, however, the antioxidants are not strong enough or numerous enough to kill off the bad guys. All we really need to know about free radicals is that by eating beans and blueberries we can successfully do battle with them. —Wine or beer in moderation. —Filtered water, and plenty of it. —Well water in agricultural areas where farmers use pesticides. —Vegetables, fruits, and nuts . —Orange and red vegetables like carrots, bell peppers, and apricots. —Nutrient-rich foods (see pp. 60-61 for an alphabetical list, from Artichokes to Zucchini, of nearly a hundred of these). —Dairy products (butter, cheese, ice cream, yogurt). —Exposure to aluminum, which is used as an additive in some processed cheeses, baked goods, and grain products. Do not drink liquids packaged in aluminum cans. —Overeating: “If your belly is bigger than your hips, you’re probably eating too much, and the wrong things, too” (57). —Shade: Direct sunshine on your skin is a good source of vitamin D.
---Carnitine — “If you don’t eat meat, you should take a carnitine supplement” (63). —Chelation — “The act of removing metals from the body” (65). —Cholesterol — “If possible, avoid the use of statins as cholesterol lowering agents” (69). —Choline —“Indicated for individuals looking to reduce their dose of levodopa” (75). —Curcumin — “Use turmeric liberally! Add it to scrambled eggs, chicken, and vegetables” (87). —Fish oil — Take it in liquid rather than in capsule form: “It doesn’t taste nearly as bad as many people think it might!” (94). Dr. Mischley devotes a chapter to recommendations for the children of people with Parkinson’s: “A family history of PD is the single strongest predictor of developing this disease. . . . The cure for Parkinson’s is prevention. Loss of smell and constipation may be early symptoms. . . . The earlier one gets started on the task of preventing and slowing the disease, the better. . . . I recommend that all children of PD parents avoid dairy. . . . I recommend that all children of PD parents drink more green tea.” (137–38). Excuse me. I need to run out and ask my four children — now all in their forties --- about how often they poop and whether they can still smell it. No, not really, but I will buy them each a box of green tea and a copy of Natural Therapies for Parkinson’s Disease.